The Ripper Street TV series has been cancelled for a second time. Amazon announced the series, starring Matthew Macfadyen, Jerome Flynn, and Adam Rothenberg, will end after its upcoming fifth season. Per Deadline, season five is currently in production, in Dublin, Ireland. The series premiered on BBC One in December, 2012. 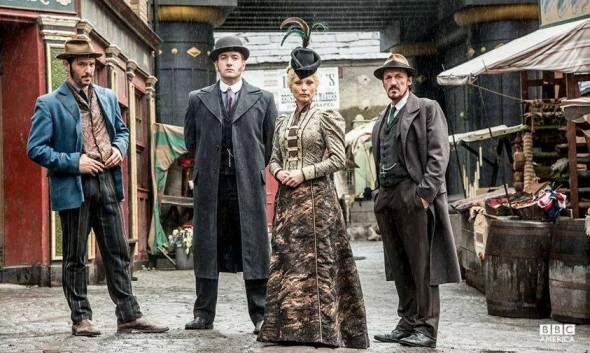 Amazon rescued Ripper Street in 2014, after the BBC cancelled it following its first two series (seasons). The third and fourth seasons are available in UK on Amazon Prime. In the US, BBC America has aired the first three seasons. Amazon renewed Ripper Street for a fourth and fifth season, back in May, 2015. In hindsight, executive producer Saul Venit’s statement about the renewal telegraphed that Ripper Street might be winding to a close. It was this time last year that BBC America announced it would air the third season of Ripper Street in the States. If and when they announce the premiere of Ripper Street‘s fourth season, we will let you know. In the final season, writer Richard Warlow shows how, as the Victorian age comes to a close, the police officers of H Division attempt to maintain law and order on the streets of Whitechapel. Joseph Mawle (In the Heart of the Sea) rejoins the series as the feared Detective Inspector Jedediah Shine, intent on a mission of revenge after last being seen in the series two finale when Inspector Reid (Matthew Macfadyen, The Enfield Haunting) plotted with Drake (Jerome Flynn, Game of Thrones) to take Shine’s life. What do you think? Do you think the Ripper Street TV show is being cancelled too soon, or does ending after the fifth season feel right to you? Tell us! Won’t somebody pick up Ripper Street, again, and give us more of that good thing? Please renew the 6th season and bring back Drake and that all what previously happened was just a dream….thank you! I was very disappointed on this show’s cancellation. There are so few productions on TV now, that to lose this one is truly a tragedy. I don’t understand who decides these things, since our family never gets surveyed as to the popularity of any of the shows. The historical accuracy and the quality of the actors is superb. These four seasons have been so captivating that I cannot go out the house. The actors are amazing, not to mention the writers. I was so sorry to see Drake die – I was hoping Captain Jackson had a miracle in his bag. If you continue to season 7 I would be very happy indeed. This is a first rate high caliber presentation of the period and the acting is exemplary.Such great writing of course is the reason but with actors of this range it moves along so seamlessly one forgets and becomes lost in the story.It has been such a pleasure to stumble upon this series.I hesitate to start season four and episode seven.It’s like the last spoonful of your favorite desert…bravo to all and thank you…now lets get “Ripping”on season five!